The organizers of todays demo of Turkish fascists and nationalists announced yesterday that they were expecting 1000 people on their demo, but only about 300 showed up earlier today. At the autonomous center (AZ Wuppertal) people confronted the fascists and nationalists with spontaneous counter protests. A reportback. As I walked through the city center of Wuppertal-Elberfeld (Germany) I saw many many cops. Five police vans were positioned near the autonomous center (AZ Wuppertal), one of them directly in front of the center. It was shortly before 04:00pm, about half an hour before the gathering of Turkish nationalists and fascists would start at Karlsplatz. At Gathe I also saw the first nationalists and fascists in front of the DiTiB mosque. The DiTiB mosques are sponsored by the Turkish state and many of these mosques supported the Turkish war of aggression during their Friday prayers, calling for a holy war against the YPG and YPJ. I arrived at Karlsplatz shortly before the gathering of the Turkish nationalists and fascists started. I saw some blue flags of Turkish Grey Wolves (a fascist group in Turkey). One of the Grey Wolves also saluted with the Grey Wolves salute (image below). Yesterday the organizers announced that they were expecting 1000 people but only about 300 nationalists and fascists showed up. That’s still 300to much. I saw a few anti-semite shields and one of the speakers said that the Turkish armed forces brought democracy to Afrin… The fascist Grey Wolves salute was also showed by one of the speakers at the microphone. People were chanting slogans against the PKK and shouted Türkiye! Türkiye! After about 90 minutes they started marching. 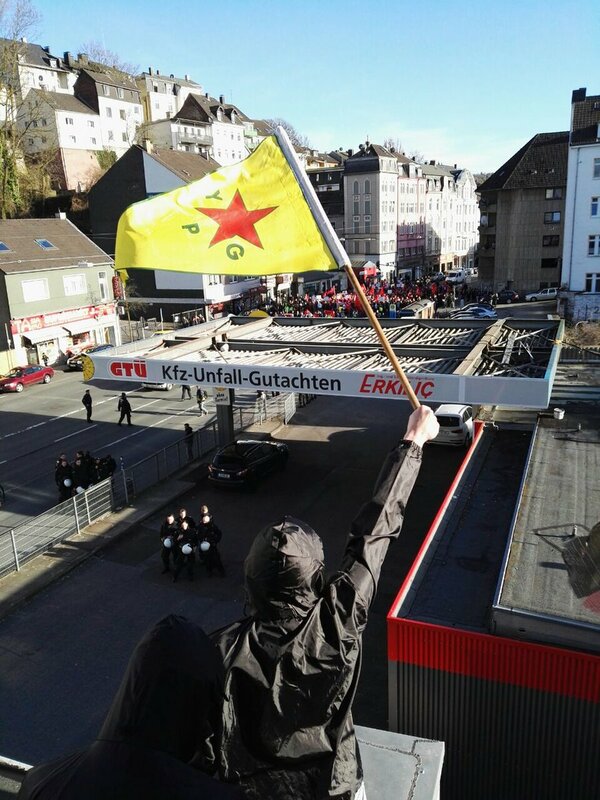 At Gathe the Turkish nationalists and fascists were confronted with spontaneous counter protests from the terrace of the Autonomous center (AZ Wuppertal) in Wuppertal. People shouted slogans in solidarity with Afrin and Rojava and were waving an YPG flag. This made the nationalists and fascists furious but the counter protesters were much louder. The cops reacted nervous and filmed the counter protesters. The autonomous center is near to the local DiTiB mosque (sponsored by the Turkish state) where the nationalist- and fascist demo stopped before they returned to Karlsplatz. During the night hours small groups of Turkish fascists were walking in the neighbourhood and there were a lot of cops patrolling the area. Wath out and take care of each other! Image gallery below: Image number 3 Some of the Turkish nationalists and fascists were also waving with German flags. Images number 5, 6, 7, 8, 9 and 10: Turkish fascists directly at the backside of the autonomous center in Wuppertal. The guy at the left side on image number 9 threatened people at several demos in solidarity with Afrin in Wuppertal, Germany. Solidarity campaign for Afrin. All profits go to Heyva Sor in Rojava. Click here. Previous post: #RefugeesGR Statement by 5 of the accussed of the Moria 35 – Take action!